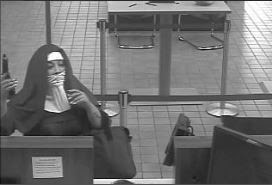 Two women dressed as nuns and carrying handguns tried to raid a bank in the Poconos on Monday. The attempted robbery happened at Citizens Bank near Tannersville just after noon. Authorities say two women showed tellers a handgun but left without taking anything. na waoh just imagine this?